Russia Says Isis Planning To Gas Syrian Civilians, Frame Assad, To Justify Another US Invasion – Coercion Code – "Dark Times are upon us"
Moscow, Russia – On Thursday, during a weekly press briefing by the Russian Ministry of Foreign Affairs, spokeswoman Maria Zakharova explained that their intelligence has revealed active terrorist plots to stage chemical attacks in Syria in order to justify and precipitate U.S. strikes and increased intervention in the Syrian civil war. The information exposes ongoing plans by Syrian terrorist groups to stage chemical weapons attacks, to be blamed on the Assad government, in an effort to justify U.S. attacks against Syrian government forces. “According to information available [to us], Syrian terrorist groups plan staged provocative actions with the use of chemical poison gases to justify US strikes against the positions of the Syrian government forces,” Zakharova said at a weekly press briefing. The intelligence reveals that ISIS has deployed laboratories and equipment for manufacturing chemical weapons from its capital of Raqqa to Deir ez-Zor, according to Zakharova. “Daesh is transferring workshops and equipment for the production of ammunition, including those equipped with chemical agents, from the city of Raqqa to the controlled areas of Deir ez-Zor province,”Zakharova said. With the U.S.-led coalition claiming to have almost completely encircled the ISIS capital of Raqqa, it begs the question of how the terrorists are able to move these chemical laboratories without complicity from the U.S.
“I think you can speak with a high degree of probability about complicity with insurgents,”Zakharova asserted. Although the U.S. was quick to blame the Assad government for an April 4 chemical attack in Khan Sheikhoun without any independent corroboration, MIT professor, and former DoD analyst Theodore Postol thoroughly debunked this assessment and revealed that it was much more likely the work of terrorist groups attempting to draw the U.S. further into a Syrian regime change operation. “We will continue to consistently seek the most professionally rigorous and politically impartial investigation into the investigation of both the Khan Sheikhoun chemical incident and other persistent chemical provocations against the legitimate Syrian government,” Zakharova said. On April 4, the National Coalition for Syrian Revolutionary and Opposition Forces supported by the United States blamed the Syrian government for an alleged chemical weapon attack in Khan Sheikhoun in Syria’s Idlib province. 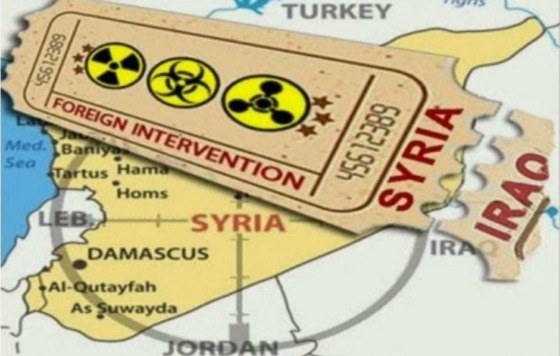 Reacting to the incident, Washington, which had not presented any proof of the chemical weapons use by Damascus, launched 59 Tomahawk cruise missiles at the Syrian governmental military airfield in Ash Sha’irat on April 6. Damascus has repeatedly denied any involvement in the incident and said that the Syrian government doesn’t possess chemical weapons as the full destruction of Damascus’ chemical weapons stockpile had been confirmed by the Organization for the Prohibition of Chemical Weapons (OPCW) in January 2016. In an interview with Sputnik on April 21, Assad characterized the alleged chemical attack in Khan Sheikhoun as a provocation to justify the US strike on Ash Sha’irat. The Syrian leader also warned of the possibility of the new provocations similar to the one in Khan Sheikhoun. Then just last week, the Trump administration began publicly claiming that the Syrian government was planning new chemical attacks but failed to present any evidence to support the bold assertions. The White House vowed to make the Syrian government “pay a heavy price” for the use of chemical weapons. These new assertions lay the groundwork for terrorists to attack civilians with chemical munitions, only to have the blame be shifted onto the Syrian government as a “legitimate” reason for attacking Syrian government forces. The Kremlin publicly commented on the White House’s claims and said that it considers US’ threats against Syrian legitimate leadership to be “unacceptable.” The Syrian government in Damascus also denied the information. “Are you concerned that that could have created an opening for terrorist groups to carry out a chemical attack?” Maupin asked Nauert during the State Department’s press briefing. Nauert gave Maupin a looked stunned by the question. “No,” Nauert said, revealing a complete lack of logical thought. Like a good little puppet for the U.S. war machine, Nauert refused to even acknowledge the possibility and quickly attempted to shift the conversation away from Maupin’s questioning and the very distinct reality that the administration’s statements clearly set the stage for a false flag attack that could quite easily be blamed on the Assad government. It is also important to note how ignorant someone would have to be to believe that Assad would ever gas his own people given the known consequences of US intervention. He would effectively be signing his and his entire administration’s death certificates. When you see statements such as these it’s time to be extremely vigilant, as there is a clear movement towards deepening U.S. regime change operations in Syria under the guise of humanitarian intervention.